Let me introduce the newest author of the family from a long line of writers, which include poets, children's author, a contributing writer for travel publications and a political writer who also wrote speeches for a past Speaker-of-the-House. The New author is my son Quinlan Powers and his book "Salvation" can be found at http://amzn.to/2G5rHkE. This is not a detailed look on how to self publish, but I did learn a lot myself. Amazon makes it easy for anyone to publish a book. This book is only has been released as an eBook so far, but in the next week or so, it should be available in paper back. Please check out the book at http://amzn.to/2G5rHkE. It is priced at $2.99. 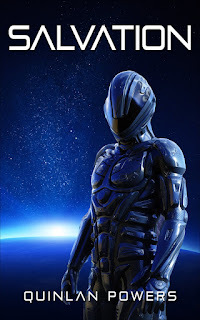 If you are a fan of science fiction, you will love this fast paced book.